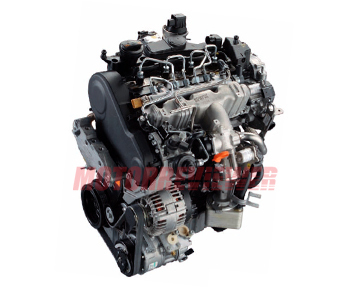 The 2.0 TDI Common Rail engine is based on previous version - the 2.0 TDI PD engine. This new engine belongs to the EA189 family (VW Emission scandal), which including the 1.6 TDI engine and 3-cylinder 1.2 TDI engine also. Many new engine components were developed to meet the growing requirements concerning noise characteristics, fuel consumption, and emissions. The most important in this case is switching to the injection system Common-Rail. The engine has forged steel crankshaft with four counterweights instead of eight. It reduces the load on the crankshaft bearings and the noise from vibrations. The 2.0 TDI CR uses its pistons with a more volume combustion chamber, because of this the engine has lower compression ratio 16.5:1. The most noticeable change is the new cylinder head. It is made of aluminum and has for valves per cylinder and two camshafts. But the timing belt drives exhaust camshaft only, and the intake camshaft drives by gear from exhaust camshaft at the rear of cylinder head. The 2.0 TDI engine got variable geometry intake manifold, roller finger cam followers with hydraulic lifters, electronically regulated variable geometry turbocharger integrated into cast iron exhaust manifold, diesel particulate filter, low-temperature EGR system and Bosch EDC 17 electronic ECU. Two-liter engine can be equipped with two balancing shafts in depends on vehicle model. VW Motor Polska Sp. z o.o., Audi Hungaria Motor Kft. By itself, this engine is very reliable. The main issue is what this engine was in the Volkswagen emissions scandal (also known as "emissionsgate" or "dieselgate"). CBDC - 110hp /4,200 rpm; 184 lbf ft/1,500-2,500. CAGC - 120hp/4,000 rpm; 214 lbf ft/1,750-2,500 rpm. 2009 SEAT Exeo engine. CAGB - 136hp AUDI A6 C6 CR engine. CFHC, CBEA, CBAB, CFFB, CBDB, CJAA - 140hp/3,750-4,150 rpm; 236 lbfft/1,750-2,800 rpm. Volkswagen Golf Mk6 engine. CAGA - 143hp/4,200 rpm; 236 lbf ft/1,750-2,500 rpm. Engine for Audi B8 A4, Audi Q5, SEAT Exeo.